This Authorization Form of Subcontractor is used in a tender process and shows the subcontractor is supporting the contractor for the project they bid on. It's a legal obligation, that after the bid is awarded, the Subcontractor can be held responsible for its duties. This Authorization Form is drafted and screened by legal professionals that have experience in special law-related fields and are actively involved in legal issues around the topic. This Authorization Form of Subcontractor template covers the most important subjects and will help you to structure and communicate in a professional and legal way with those involved. Download this Authorization Form of Subcontractor template now and save yourself time, efforts and possibly reduce the lawyer-fees in order to become more successful. 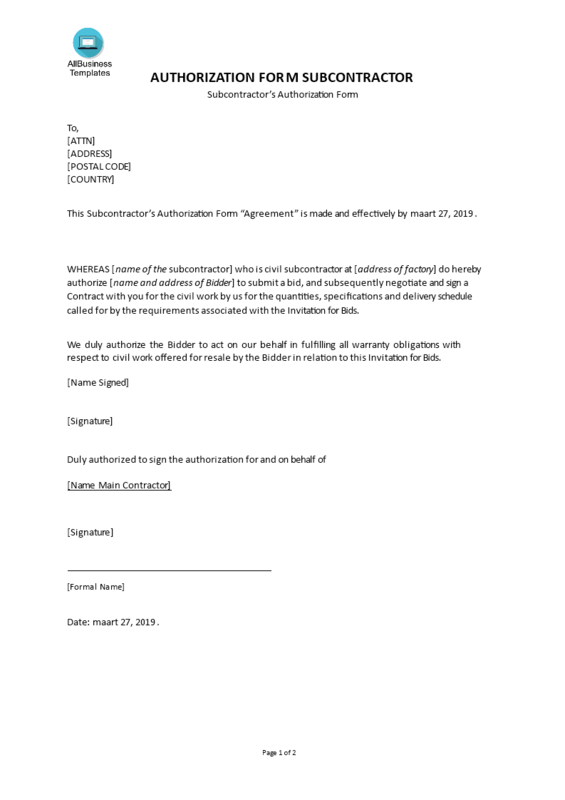 Using this Authorization Form template will help you to deal with the situation! However, this Legal template will help you dealing with this legal matter, we still recommend you to consider to find legal support in case you have doubts dealing with it the right way.